Star Warz has been promoting quite some decent Drum ‘n’ Bass nights over the years now, but our next edition is a very very special one! We managed to unite two of the biggest, baddest & most influential record labels in Drum ‘n’ Bass history on one night !! Both of these need no introduction as they shaped the scene as we know it today! There’s even no beginning in trying to explain the important role these record-labels have played in creating the Drum ‘n’ Bass scene over the years. Dons like Ed Rush & Optical and Marcus Intalex have always been pushing the bounderies of this crazy music we love so much … and are still doing it today. When Ed Rush and Optical launched their own pursuit to change the course of dance music back in 1998, I don’t think even they could have forseen the growth Virus Recordings has had over the past 15 years. Coming from early beginnings, the label has in its time released the likes of Fiece, Matrix, Bad Company and Cause 4 Concern. Home to the sound of British techstep and neurounk, Virus is on a constant mission to inspire the next wave of sub genres. So of course, when they decided to throw their 15th Birthday Bash at Star Warz, they have to bring together the biggest of talent – from across the board. And with Audio, Matrix, Optiv & BTK, they have! Soul:ution is the club night based around Soul:r artists Marcus Intalex, Calibre, Lynx, S.P.Y and MC DRS, with regular guest appearances by the likes of Doc Scott, Klute and dBridge and others. Soul:ution promises to deliver a night of uncompromising music delivered by some of these popular, experienced and versatile DJs. Expect soulful Drum ‘n’ Bass, but not just that: Soul:ution is about future music, with quality and depth. For a taste of what to expect check out the Soul:ution radio show on Red Bull Music Academy Radio. Among many one-off bookings across the UK & Europe, Soul:ution residencies currently include Manchester, London (at Fabric) and Bristol. We are so proud to have these legends & their labels over at Star Warz, once again, and we assure you that they will blow off the roof ! 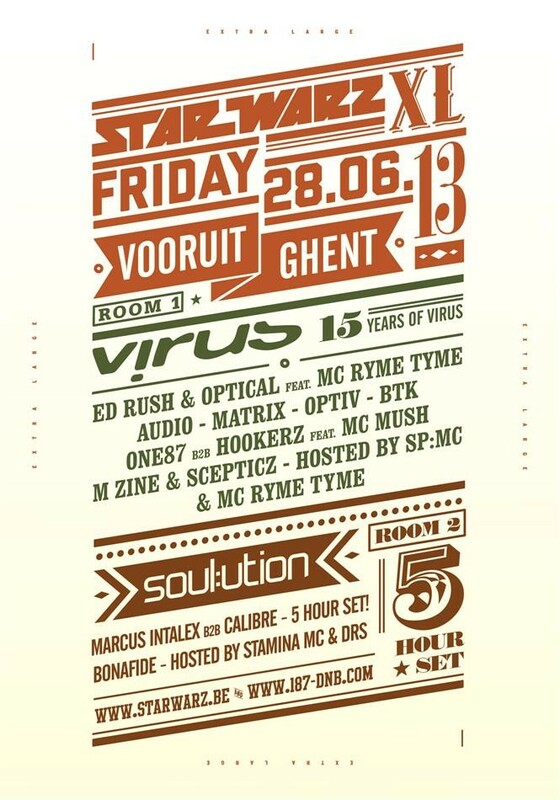 Are you ready for this huge Drum ‘n’ Bass night in the Vooruit in Ghent?? Two rooms full of madness, brought to you by the finest artists on this planet!! Make sure you don’t miss out on this one, because this night will -without any doubt- go down in Drum ‘n’ Bass history ! And don’t forget it’s only 15€ for a presale ticket !